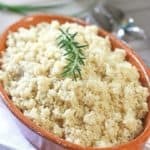 How to Oven Bake Quinoa, White or Brown Rice! How to cook quinoa or rice perfectly every time by baking it in the oven! Once you try this you will never go back to the stove top method. Heat 2 cups water or broth in microwave for 2 minutes. (I just use my measuring cup). Add quinoa (or rice) to 8 x 8 baking dish. (9 x 9 will work as well). Pour hot liquid over the grain. Add salt, pepper and butter if using. Bake quinoa or white rice for 25 minutes. Bake brown rice for one hour. Remove - LET REST 5 MINUTES. Carefully remove foil - its hot in there! Nutrition information is for one serving of quinoa.